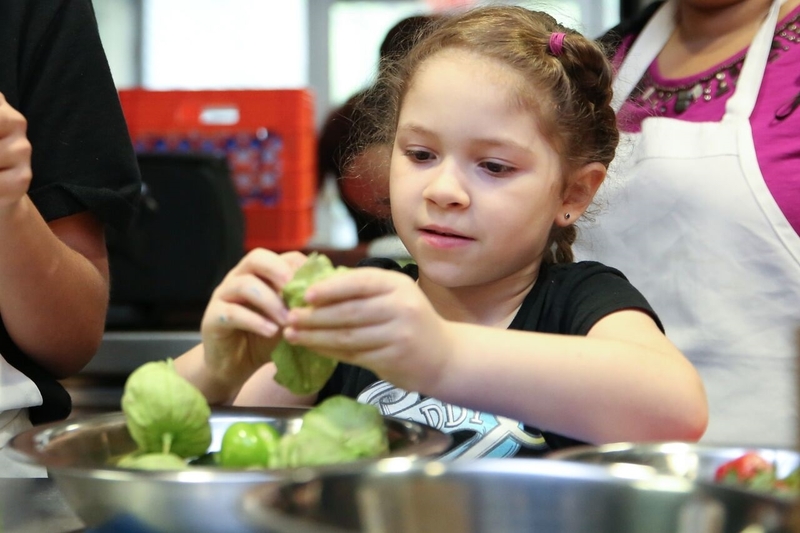 In speaking with chef educators who specialize in cooking with inner-city children, the consensus is unanimous: our at-risk children, those in communities with the highest incidents of diet related disease, can -- and want -- to learn about healthy eating. Bring a child into the kitchen and imagine what happens? There is excitement and engagement around the various tasks of food preparation. Children are motivated to experiment and explore, and that is only the beginning of food magic. 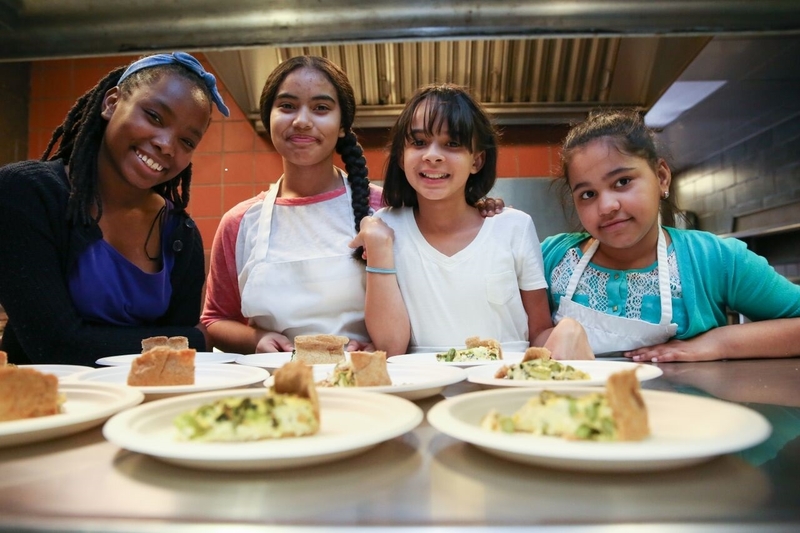 In speaking with four chef educators who specialize in cooking with inner-city children, the consensus is unanimous: our at-risk children, those in communities with the highest incidents of diet related disease, can - and want - to learn about healthy eating. Although their food preferences might not resemble mine, they too want to enjoy delicious and well-prepared foods. The first steps are simple, especially for the younger groups starting at age 7 with mixing, assembling and learning basic knife skills. The bear claw (with arched fingers), holding the food while the other hand works the knife, is practiced over and over as small hands take big strides. The next level involves learning how to use peelers and graters. Favorite tasks include whisking vinaigrettes, squeezing citrus or mashing avocado for guacamole. Cracking eggs is a learning experience as many children think they require squeezing. The instructors take this loss factor into consideration when calculating egg quantities! Then they are ready to move closer to the stove, stirring a pot, tending a skillet, learning about the oven's thermostat and checking the progress of baked or roasted food. There are generalizations about likes/dislikes that seem to be consistent at different cooking programs. Zucchini, potatoes, carrots and cucumbers get 'likes'. Cauliflower, broccoli, kale (even in chip form) merit "meh". "Weird" is reserved for beets, eggplant and green beans. Salads are not a consistent part of home meals - neither leafy greens nor veggie salads. There are few fruit desserts, and blueberries nor peaches are familiar items. Herbs, like basil, are new. Learning that a bulb of garlic is broken into cloves and then chopped is new. Within six weeks, young children show enthusiasm for trying new foods spurred by new flavors, textures and colors. "I want the recipe so I can take it home and cook with my mother" is frequently expressed. Theresa Morelli, a Sylvia Center chef instructor, has been working with youth and teens for five years. Conducting classes at the Red Hook community center the students take advantage of the community garden, which adds a deeper dimension to the exploration of food. Basil becomes pesto and the hand picked tomatoes & cucumbers make a salad. Teresa reflected on the sense of privilege she feels being in the kitchen with her students. "They take it seriously and learn more than they realize. There are wonderful conversations despite getting them to eat green things. I sneak in food advice and encourage them in new ways." It is in this environment that the students share stories about food, family and their lives. She describes the eaters who pick the veggies out of the pasta dish and celebrate the young girl who made the asparagus and feta frittata for Mother's Day - and then posted the photo on Instagram. The most popular class dishes are muffins, frittata and smoothies. Less beloved are the butternut squash and beans. Leafy greens find their way into her pasta dishes, notably lasagna, and get eaten. The rule - the 2-bite test. And after 2 bites, you can pass on a new food. Just Food, also a NYC based food focused non-profit directs its efforts at supporting capacity building community based food projects. Known also for deep relationships with regional farmers and pioneering CSA's in the city for over 15 years, bringing fresh food to local pantries and being a leading voice in food advocacy, Just Food ran Community Chef Programs for several years training youth to lead cooking demos in community centers, gardens and markets. Heather Horgan is the Markets and Outreach Coordinator for East NY Farms in Brooklyn and continues the work of the program. Reminiscing about her pathway to food advocacy, she recalled lessons from her Southern grandmother and the small garden where they grew peas and beans. Though she slipped into a diet style of fast food, she reconnected as an adult via a job with the Food Bank of NY. "Decolonizing our tastebuds" is how Heather described the process of getting back to "natural, culturally relevant food." The program is rooted in the principle of "We Do" - 'we grow the food, we pick it, and we cook it' so the children see and taste with heightened senses and new appreciation. The garden is the catalyst for cooking as well as community work. The youth program is tiered with 1st year interns (middle school age), returning interns and finally externs (HS seniors/college students) who work in the East NY Farm as well as other communities throughout the city. A weekly 4-hour cooking class for interns and staff yields lunch for 40 ++. Knife safety, sanitary habits, washing produce and basic nutrition guidelines permeate the lesson. They are at an age where they can start to cook and make their own food choices. Many of them are intrigued by the work and aspire to be chefs. In short order, they are leading cooking demos for even younger children - in the market, at day care - and mentoring the next group. Nina Simmons, a lead chef instructor for a pilot program funded by TASC (The After School Corporation ) and The Pinkerton Foundation, an apprenticeship program for 25 selected Bronx high school students from TASC affiliated schools. The program titled TSC Teen Chef: Skills for Life, was 60 hours long over the course of 16 weeks. Most of the participants had "no clue about eating healthy food or being in the kitchen." In addition to learning culinary skills, the students were giving reading assignments, learned about food justice, the industrial food system and how to teach. With ongoing guidance and mentorship, they are currently in summer internships at community centers across the city, instructing two youth classes a week in the art of cooking! The goal is multi-faceted. Creating lifelong healthy eaters is a goal as is teaching skills that can lead to employment, a critical factor in initiating lasting lifestyle changes. "Often SC students will try many veggies and fruits for the first time or try them in a recipe they've never had before and be surprised that they like it. I was even surprised at how many kids love cauliflower in a frittata. Hopefully this plants a seed of being open to trying new things and that eating healthy doesn't have to be all that bad." Everyone wants to eat better food. If the message is dogmatic, the lesson will be lost. 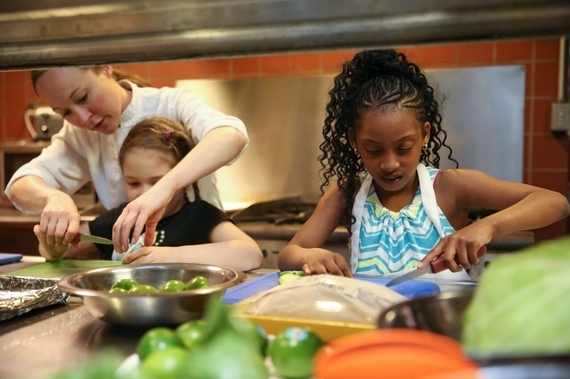 Kids learn by doing - cooking is doing. Stuffing empanadas or dumplings is a favorite. The media can be our friend - kids think cooking can be cool. Teens quickly latch on to the professional possibilities cooking can offer. Seeing food in its natural context is mind blowing. Seeing spinach reduce during cooking is an 'aha' moment. The precision of measuring cups is new and a completed task is a proud moment. "Just because kids are low income does not mean they cannot appreciate or want to learn about new food," says Whitney, Program Manager for SC/NYC. "These children are not even thinking about where food comes from," says Nina. "There is no initial concept of seasonality. Thinking about food is a privilege of ours. It's a crazy difference to look at life through the food filter." This piece was originally published in Our Town.